PhillipsFiberArt.com Free Patterns by Cheryl Phillips are protected under the United States copyright laws. While you may print these patterns for classroom or demonstration purposes, they are not intended for resale. While you may link your site to the PFA product page which includes the free pattern, you may not directly link to the pattern itself. You may not provide this pattern on your own web site without written permission from Cheryl Phillips. Our free patterns are written to enhance our products and promote our website. When displaying a quilt in a public show which was made with one of our patterns, please acknowledge the source. We appreciate you adherence to Federal Copyright laws. Shipping is based on weight of your combined products and your state location. If you order more than $100 you have the option of free shipping! FYI: Shipping a Two piece Ten Degree is a better rate than the Ten Degree standard. Its one way to save if you are into saving money. Please note shipping is costly. We have researched our rates and have done our best to be accurate. We choose not to offer first class on any tool as the insurance we pay into priority mail will cover the cost of the item to be reshipped. If you have chosen to have your pattern sent first class we do not take responsiblity in its replacement. If you have an issue with your priority mail and need to make a claim with USPS this is your responsibility to do so. Ten Degree Tools FYI: We are no longer shipping the standard Ten Degree Tools internationally due to breakage. Please select the Two Piece Ten Degree instead. Add your item to the shopping cart and additional items. View Cart. Enter your discount code and hit enter. 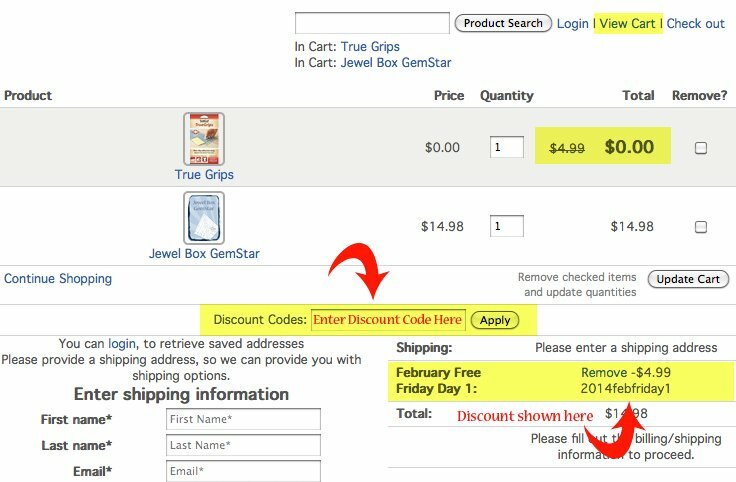 If the Discount Code does not work check that you have put the correct promotional product in the shopping cart and check that your total purchase before the promotional product is correct (if minimum purchase applies). The Discount code works only on the day(s) of promotion. Only one discount code can be used in a single purchase. If you have 2 discount codes select the one that gives you the best discount and use it. See example of cart with discount code entered here. If that doesn't help check your computer for a mute button or volume button. Last try going to YouTube.com (following the links on each video page or go to our channel) and see if watching it from their site works any better. If none of these work, there may be more settings on your computer that I don't know about that might be the issue. Contact a computer specialist to assist you. 1. Place it on a flat table and align the edges of the tool. 2. Tape one side to keep it together. 4. Use super glue sparingly along the seam (break line). 5. Let it dry over night. 6. Adding wide clear packaging tape to both sides adds strength. What Software did you use on your fussy cutting video? As a graphic artist, I have found many techniques to test and sample our products. We currently don't have any association with any of the software companies that make programs to do such design work. We may look into this in the future but for now it's not available. I'm sorry to not have a better solution. Although we won't be demoing how we did this on the computer we will be doing a follow up video on our favored techniques for fussy cutting. One of which is how we find the designs in the fabric when the computer is not available. We'll be sending an email out when it's uploaded to YouTube or you can subscribe to our YouTube for even faster notification of new videos! What is the Two Piece Ten Degree? The Two Piece Ten Degree Wedge set will make a full size Ten Degree Tool for a 50" circle and is split exactly in half. • Included in the packaging is a "bridge" to connect the two pieces. • The smaller piece is not the same as the mini ten, it's longer. • As an added bonus we're including a pattern that specifically uses the two pieces separately for a 40" circle. See the Two Piece Ten Degree Product Page for more information. How do I download a PDF from your website? click here for a tutorial to download a PDF. How do I print a PDF template? Many times your printer will adjust your document to fit on your sheet. This will mess up the size of your template and it will no longer be accurate. Here is a tutorial on how to adjust your settings to print templates. Please note all of our "for sale" patterns and books are physical copies only. We do not sell any PDF downloads at this time. This may be available in the future. Where do I find more on my favorite products? We have more information on many of our products on the Rest of the Story! Grids and graphpaper, squaring templates, binding tips and much much more!